Ministry of Culture collaborates with Google to register archaeological monuments in the Google Street View (GSV) project. 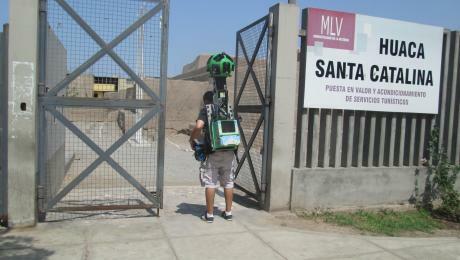 Under the framework of the Inter-institutional Cooperation Agreement (Convenio Específico de Cooperación Interinstitucional) between the Ministry of Culture and Google, the archaeologists of the General Directorate of Intangible Archaeological Heritage join the operators of the mentioned company in their field visits to archaeological sites in Lima. This project requires access to 91 immovable properties declared Cultural Heritage of Peru, including the Machu Picchu Historic Sanctuary, the Sacred City of Caral and the Citadel of Chan Chan. GSV is a tool of Google Maps and Google Earth that provides panoramic view at street level (360-degree horizontal movement and 290-degree vertical movement), allowing the users be part of the selected cities and their surrounding metropolitan areas. This technology, presented in the United States in 2007, has been expanded to 59 countries up to now. The equipment used by the operators of Google to capture images, known as “Trekker”, is a portable system to capture panoramic images of approximately 45 pounds carried in a bag, which assures the integrity of archaeological monuments during the visit. The Ministry of Culture has given the advices and standards required to execute the project, which will permit to diffuse the archaeological heritage of the country through virtual tours thanks to GSV system.